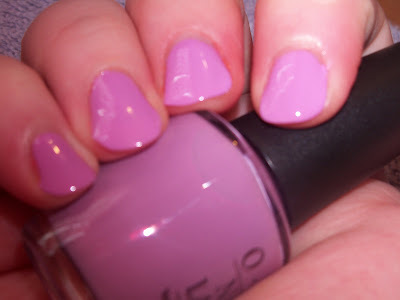 I recently had the chance to review OPI's Spring 2010 Hong Kong collection. I swatched these polishes while I was struggling with my new camera, so some of the shots are good and some are not so much. I meant to re-do these, but I wanted to go on and post this collection while it was still relevent. If anyone wants me to reswatch something so you can see it a little better, please ask. I also swatched some on my rarely-seen right hand as I had a nail I was babying (it's since been chopped off). Hot & Spicy – Unlike most orange-based corals, this one actually worked with my skintone, and I rather like this one on, unlike say, ChG High Hopes. If you were like me and High Hopes didn’t work for you, check out Hot & Spicy. They are similar colors (hopefully comp pic to come soon), but Hot & Spicy is about 2 shades lighter, a little less bright, and a lot more compatible with pink-based skin. Pic is 3 coats and I didn’t have any application issues, other than a wonky brush. Bling Dynasty – Gold is one of those impossible colors for me. I keep trying to find the perfect one, and I’ll think I’ve found it, only for it to not work with my skin, just like all the others. This one is a bit of an exception, because I do like it on me. This one is definitely more mustard than a straight-up metallic gold. It almost looks like they took the tone of grainy mustard, made it metallic, and threw in some pink and green shimmer. Even though I do like it, it’s not the most wearable of colors for me. I would probably be more apt to wear it in the winter. However, I think this would look amazing with a tan. Pic is 2 coats and there were no application issues. Jade is the New Black – This is one of the 2 colors of this collection I owned prior to being sent this to review (with Suzi Says Feng Shui being the other). I loved it before and I love it now. It’s a medium-toned, green cream, which reminds me of Misa DSM’s darker, less dusty cousin. This is one of the stand-outs from this collection. Pic is 2 coats and I had no issues with application. Suzi Says Feng Shui – Ah. If you have read my little blog for any length of time, you know that I love blue polishes, especially medium-toned blue crèmes, like this one. And this one has to be one of my favorites. In my collection, this one is very similar to another recent OPI, Ogre-the-Top Blue. However, this one is a bit darker and a bit dustier. Hopefully, I will get a comp pic for you soon. Pic is 2 coats and there were no issues. 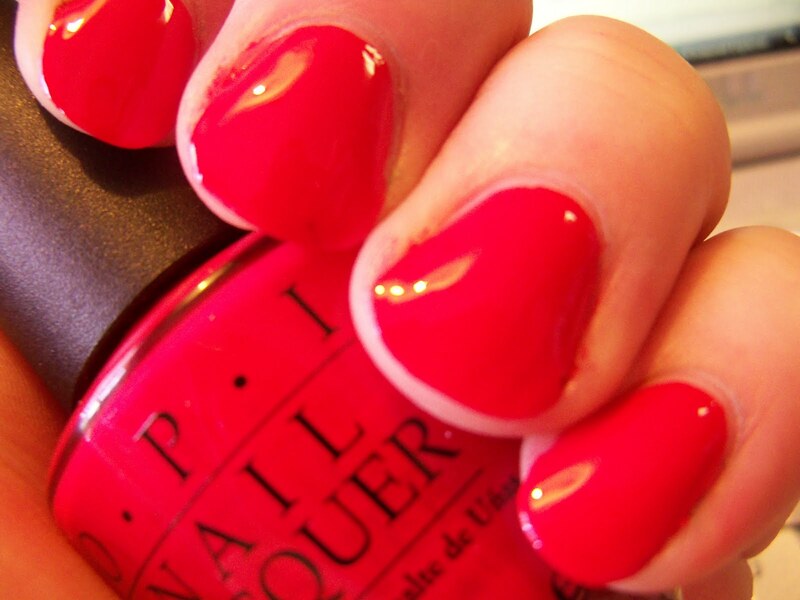 Red My Fortune Cookie – What would an OPI collection be without a red? 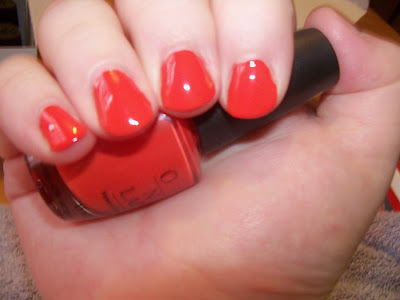 Like it or not, you have to admit if there is one thing OPI does well, it’s their reds. This one is no exception. In fact, it’s risen to be one of top reds in my collection. This one reminded me of about 3 different things. At first, I wanted to say that it’s a very retro red, and it is. But, due to the extremely glossy finish, it’s very reminiscent of red Chinese lacquer. Pic is 3 coats and I had VNLs at 2. No app issues. A Good Man-darin is Hard to Find – Perhaps I’m overthinking the name, but Man-darin, to me, other than simply being a pun, would indicate an orange; more specifically, the color of mandarin oranges. This color technically is an orange, but it’s more of a red-orange. In fact, if you were to open up a box of 64 Crayolas and find orange-red it would look like this. I love the color. Normally, orange based reds (or red based oranges) look like crap on me. My skin is just too pale and they look too stark. However, this one is perfect. The finish, like Red My Fortune Cookie, is very glossy. Pic is 2 coats, and there were no app issues. Dim Sum Plum – I know this kind of color has been making the rounds with the various manufacturers/collections, but for some reason, I don’t own any. 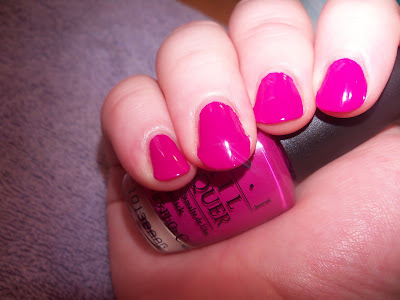 In fact, the only color in my collection that I think would come close would maybe be OPI Miami Beet, but it’s much darker. There may be an untried from OPI Spain, but I can’t think of it off the top. DSP is a medium-toned, slight dusty berry/plum shade (though I think it’s more berry than plum). Either way, it’s beautiful, if a little non-original. Pic is 2 coats and again, no app issues. Meet Me on the Star Ferry – I’m not sure how I feel about this color. It’s a slightly deepened, dusty plum metallic shimmer (I think this one is much more plummy than DSP). It has the same pink and green shimmer as Bling Dynasty. It’s a very pretty color, but for some reason, it wasn’t hitting any high notes with me. I think I’m going to have to wear it as a full mani before I can decide. 2 coats/no app issues. UPDATE - I did wear this as a full mani after I wrote this but before I posted and I did like it better for a full mani. Panda-monium Pink – This is another shade that’s becoming more and more popular right now among np manufacturers. Both ChG and CC have similar shades in recent collections. It’s a milky baby pink with that leans slightly lavender. It’s very pretty in the bottle and it looks nice on the nail, but the application was a pain. It took 3 coats to reach opacity and due to the streakiness, it was a little hard to deal with, but nothing unmanageable if you like the color. Chop-Sticking to My Story – According to my husband, this was the best name of the bunch. Unfortunately, I just wasn’t excited about this color. 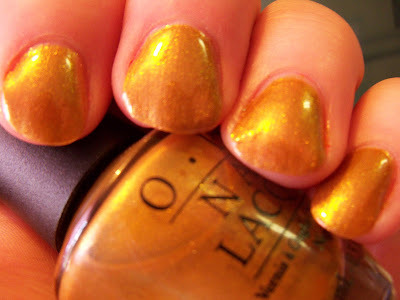 In the bottle, it looked to be of the OPI and Apple Pie/Ginger Bells variety that looked like crap on almost everyone. But on the nail… it’s so pretty. Sure, it’s not very spring/summery, but it’s unique shade of nutmeg brown with a bit of red thrown in. I don’t know how much I’d wear it now, but I will certainly wear it in the fall. 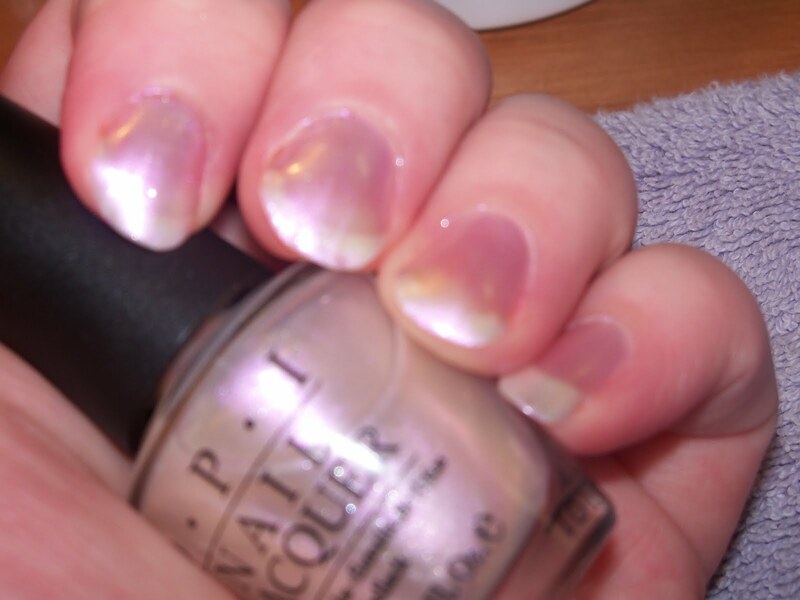 This one was opaque at one coat, though I did 2 and there were no issues. Pearl of Wisdom – There is no better way to describe this one other than mother of pearl. It’s a pink/white duochrome with a slight green flash. It also has tons of multi-color micro-shimmer. It’s a beautiful color, but it’s extremely sheer and there is no way, other than wearing it over white, that it will reach opacity. Pic is 3 coats and I could have done more. No app issues. Lucky Lucky Lavender – Though it doesn’t show in the picture, this one is definitely more mauve than lavender. It’s the darker version of Panda-monium Pink. Unlike PP this one had no application issues and was opaque in 2 coats. All in all, I like this collection. Jade is the New Black and Suzi Says Feng Shui are favorites, as was Hot & Spicy and Chop-sticking to my Story (total surprise). 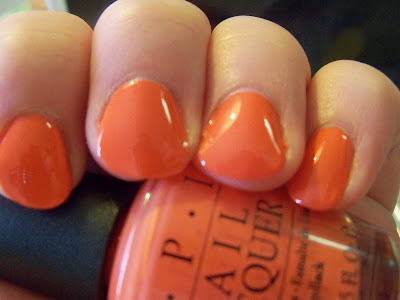 I know OPI is becoming scarce at etailers, especially for discounted prices, but you can still find them at (until they are gone) at TD and on eBay. Of course, you can also find them for retail prices at brick and mortar stores and online. nice that they sent these to you! I have about half of this collection, love suzy says feng shui and jade is the new black. I recently picked up hot & spicy and dum sum plum. This collection was really nice. And agreed on the etailer mention, I buy mine from amazon, cheaper than in stores (for now). I wish Pearl of Wisdom wasn't so sheer...I'd love an opaque version with a really pearly finish. I guess after enough layers I could make it that way. Anyway, great swatches, thanks! Aurora, you could probably layer it over white to make it less sheer, but not affect the color itself. I plan on doing some swatching over the weekend, so I'll add this to my list.